Barnaby comes from the ancient world by way of medieval England – a familiar path. Yet this name remains quite rare. 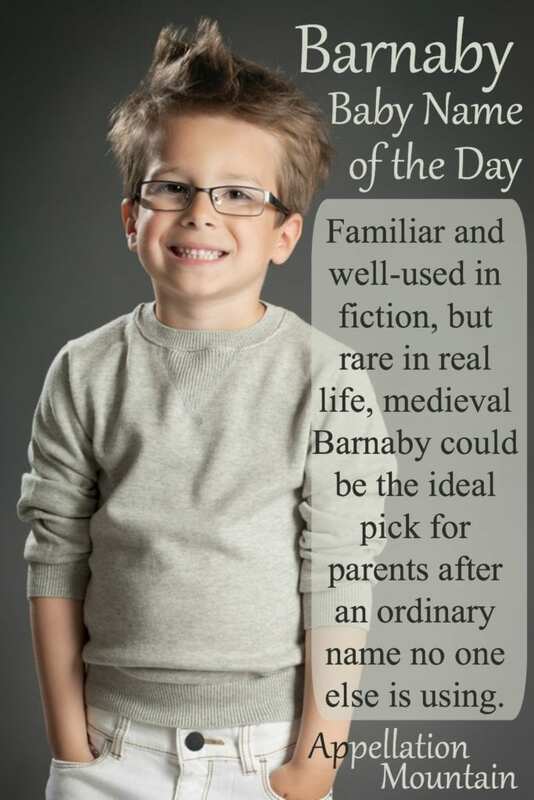 Thanks to Lola for suggesting our Baby Name of the Day: Barnaby. Back in the first century, Saint Barnabas journeyed with Saint Paul, winning converts and taking part in the Council of Jerusalem. Some accounts make him the cousin of Mark the Evangelist. Barnabas was born Joseph. He took the Aramaic name at the same time he set out to spread the gospel. Bar means “son of.” The second element might mean prophet, or it might mean encourage or exhort. Either way, it seems like a fitting choice. Barnaby evolved in medieval England, just like Margery for Margaret and Cecily for Cecilia. Perhaps the most famous Barnabas was Collins, the vampire of Dark Shadows fame in both the 1960s television series as well as the 2012 movie starring Johnny Depp. Charles Dickens wrote Barnaby Rudge between 1840 and 41. The character’s pet raven would later inspire Edgar Allen Poe. Both Broadway musical Hello Dolly! and Thornton Wilder’s The Matchmaker include minor characters with the name. In 1952’s Monkey Business, Cary Grant played a chemist by the name. His experiments go a little wild. Buddy Ebsen played a milk-drinking detective in CBS’s Barnaby Jones in the 1970s. It’s also been the name of a handful of fictional bears, along with at least one comic strip character and a few children’s book characters, too. Places to hear the name are plentiful, but actual bearers of the name? Those are harder to find. Nickname Barney fared better, ranking in the US Top 1000 from 1880 into the 1970s. Pop culture argues against the name’s use in the US – think Rubble, the Purple Dinosaur, and How I Met Your Mother – but it remains more common in the UK. A mere six boys were named Barney in the US last year. Believe it or not, that’s still more popular than Barnaby. It was given to fewer than five boys in 2015. Barnabas comes in first, with a whopping 15 newborns last year. Still, plenty of names conforming to this style have been powerfully popular in the US. Think of Jeremy (from Jeremiah) and Zachary (from Zacharias). Barnabas fits in with ancients like Julius and Atticus. 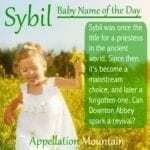 You might also shorten the name to Bas or Baz, further modernizing the ancient appellation. Considering the dozens of appealing uses of the name, it comes as a surprise that Barnaby has never been more popular. Jackson Douglas – known for playing Jackson on The Gilmore Girls – and comedian wife Alex Borstein are parents to Barnaby and Henrietta. (Trivia note: Alex was cast as the original Sookie, but joined the case of MADtv instead.) 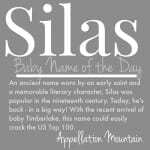 The siblings’ names feel just right together – edgy and cool, but rooted in tradition, with plenty of possible nicknames. And that’s the thing about Barnaby. It manages to be a surprising name while remaining completely ordinary. With boys answering to big, bold names like Anakin and Messiah, a quietly unusual choice can stand out, too. If you’re seeking something truly different, without being invented or outlandish in any way, this name succeeds. Would you consider Barnaby for a son? This post was originally published on March 20, 2009. It was substantially revised and re-posted on August 22, 2016. Barnaby is really cute, but it sounds too close to the dinosaur’s name for me (I have aversions). I’d consider Barnabas…I enjoyed Dark Shadows, and while Barnabas is formal, it’s not overly so. Nickname not necessary. Barnabas doesn’t feel like it has to become Barney. Barnabas means ‘son of comfort’, so maybe Barnaby means the same? I have a Barnaby known as B, Barnes and Barney but I love Barnaby best! I had only ever met one before in my life when I was 7 or 8 but since having him I know of 3 other baby Barnaby’s, and two high school children with the same name. Other women seem to be more positive about his name than men though…Chaps seem a bit non-plussed and are more comfortable with the nick names. I’ve never really been able to warm to Barnaby – I love his bouyancy and cheeriness, but he just can’t get there to me!! Like Emmy Jo, I prefer him in full, and if my son were named Barnaby, he probably wouldn’t go by a nn. Honestly, he just reminds me of Lola now 🙂 In your combos he’s pretty spunky & endearing! He’s just not for me! I like Barnaby, but I love Barney. I think Barney is adorable, and could totally work on a real child. I lean towards wanting to use just Barney, but lately have been toying with using Barnaby/Barnabas to get the nickname. Barnaby is great! I like the -ar- names, but Barnaby is especially appealing. Barnes and Bas are both good… but I don’t discount Barney. Maybe it has grown on me watching How I Met Your Mother… NPH makes me laugh. Anyhow, I wouldn’t give up on Barney as a nickname. OOOH! A Dark Shadows movie?!?! With Depp?! I second that “exciting”!!!! Err … exciting about the movie version of Dark Shadows, that is! Lola, not really! That’s so exciting. And Barnes! *Smacks forehead. * That didn’t even cross my mind. It’s a solid nn, too. I like Barnaby in full, but I don’t like Barney or Barry at all. I did suggest this name to my husband just to see what he thought (since he likes Jeremy and Timothy), but it didn’t appeal to him. I agree with Sarah that it would make a great middle name. It would be a great first name, too — I just think it’s a shame to shorten it. I really like Barnaby, as Lola says he’s unusual but doesn’t sound out there at all anc can totally imagine a cute little Barnaby… not much more to say than that – Barnaby is lurverly! Ooh, just one more thought. Johnny Depp is remaking “Dark Shadows” as a movie, if all things. Apparently, he was a huge fan as a kid too and is playing Barnabas. Maybe *that* will boost Barnabas and by default, Barnaby? It’s a project “In Development” on IMDb for 2011, it says. Hmmm. Wonder. The other half is a HUGE Drak Shadows fan, a fact I’m sure I’ve mentioned before. He used to sit in front of the TV at 3 and 4 and watch it with his big sisters, who would race home from school to catch it. Yeah. I fell in love with Barnaby because he’s a charcter in my second favorite musical of all time (and one that’s getting a bit more notice thanks to a cartoon): “Hello Dolly”. If you watch Wall-E, it’s in the first 45 seconds of the movie, as it pans in on Wall-E (we own it, and watch it about 4 times a week right now) so I’m being constantly exposed to “Barnaby!” and I love it. 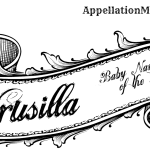 It’s a singable name and I adore those types. Cary Grant definitely didn’t hurt Barnaby either. As far as nicknames go, you pegged me, I’m a Baz lover and any way I can get it suits me fine. But a Barnaby of mine would probably end up Barnes or Barn at least 60% of the time. And Barney? Well, I figure a real kid could get people to stop associating wit the purple dinosaur. The last really decent cartoon Barney? Rubble. And I like him, at least equally as much as Rufus, for the same thing you mentioned. He’s uncommon, but sound wise doesn’t sound too out there at all. Which is a great thing, as far as I’m concerned. I can’t imagine flashy little Barnaby’s going to get much love but honestly, I don’t care if he does and am even hoping there’s not suddenly a ton of Barnaby love, I don’t want a tiny bubble of them around at the same time! Barnaby’s aces to us both and that’s all that’s really important, in our book. Thanks a million, Verity. I really appreciate this one! […] Barnaby – Thinking of Charles Dickens’ Barnaby Rudge might make some question if this name belongs on the list. […] a look back, too – in 2009, Barnaby was featured.